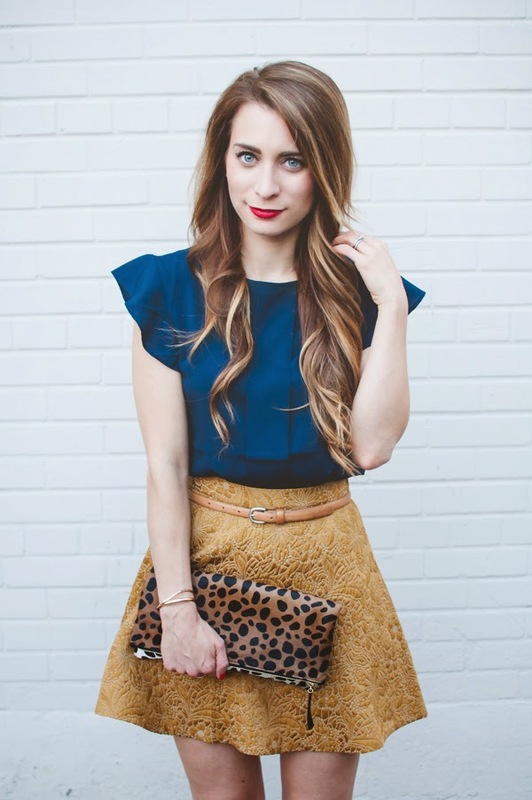 OOTD - Navy and Gold | La Petite Noob | A Toronto-Based Fashion and Lifestyle Blog. This skirt had made an appearance in a previous post, highlighting how you can use one piece of clothing three different ways. The colour makes it extremely versatile for all seasons and I love the length - not too long, but also not so short that a large gust of wind turns you into a free show. What do you think? Are you feeling navy and gold as much as I am? This is such a great pairing -- not just the colors, but the flared sleeves paired with the flared line of the skirt. Plus, leopard clutch -- yes, please! I adore your top and the way you played with texture in this outfit! Thank you! I was concerned that the texture of the skirt would make the outfit too 'heavy' for summer - if that makes any sense, lol! I'm happy with the results though! I don't know if you've noticed, but I've been all over your blog today! And let me just say, this outfit is definitely going in my top 10 outfits EVER! I love everything about it! The color scheme, the textured skirt, the sleeves of the top, the cut of the top! And those heels and those lips! I would wear this outfit summer, fall, winter, spring! Ah, I absolutely positively adore this outfit!